Motives. I do wonder about that. If I give you something, what will you give me or expect in return. The Indian Rights Association had a motive. A big one. Indians had no right to exist as they had for thousands of years. Indians were in the way, an impediment to progress and westward expansion. Back then Indians were supposed to just blend in and disappear. How convenient. But the violence didn’t stop with the assassination of tribal chiefs. “In southern what is now Ohio, (Mohicans) set up an ideal Mohican community near the Pennsylvania border. These people had their own frame houses, picket fences, cattle herds, school houses in their language,” he said. “A hundred miles away, the frontiersmen in a Pennsylvania village decided the Mohicans were hostile. “Now, these (Mohicans) were fundamentalist Christians, they were Moravian pacifists. The frontiersmen came in upon them suddenly and seized 96 of them and put them in a big barn. And while the Indians sang Christian hymns in their language and prayed for the souls of their captors, they were taken one by one to a blacksmith’s anvil and the Americans smashed their heads in with a maul. All 96 of them,” Wrone said. For many years I wondered how “they” (presidents and others) came to decide what to do with the Indians, other than collecting scalps of dead Indians or smashing their heads, or massacres, of which there were many. By the way, the IRA were not friends of the Indians, not even close. The idea of having an annual meeting to discuss Indian affairs and then make recommendations to the government was initially the idea of Albert K. Smiley, a member of the Board of Indian Commissioners and a part owner of the Lake Mohonk Lodge (in upstate New York). The annual meeting took the name of its meeting place and was called the Lake Mohonk Conference. In general, the conferences envisioned the transformation of Indians from savages to citizens by three means: (1) breaking up the reservations, (2) making Indians citizens and subject to the laws of the states, and (3) education of the young to make them self-reliant. The men who gathered each year tended to be well educated, financially secure (most were considered wealthy) and had been born into the upper classes of eastern U.S. society. They often viewed their participation in the conference as a part of their larger Christian obligation to bestow the blessings of Christianity upon all of the under-developed people of the world. While these reformers were genuinely concerned about justice for Native Americans, they were unremittingly ethnocentric. To them, the Indian cultures-the tribal languages, values, religion, social models, communal ownership of the land, the aboriginal lifestyle-was an anathema to modern civilization. The eastern philanthropists who met at Lake Mohonk had rather mystical faith in the value of private ownership. They felt that private ownership of property had the power to transform the Indians into people more like themselves. Believing in the sanctity of the private ownership of land, they had little understanding of Indian culture and little concern for the actual living conditions of Indians. In their 1884 meeting, the Lake Mohonk Conference recommended that Indian education must teach the English language; that it must provide practical industrial training; and that it must be a Christian education. Like most Americans at this time, he was apparently unaware that Indians had been farmers and had developed their land long before the arrival of the Europeans. It was the supreme struggle of Paganism against Christianity, and Paganism went down. That is the second reason why there is this wonderful progress in this religious movement. The 1896 Lake Mohonk Conference called for the abolition of the tribal system and for Indians to become citizens. At this time, many Indians were not citizens and the only way that they could become citizens was to accept an allotment of land and to be eventually deemed “competent” by the Indian agent. Occasionally, the Friends of the Indians did more than just talk about Indian issues. 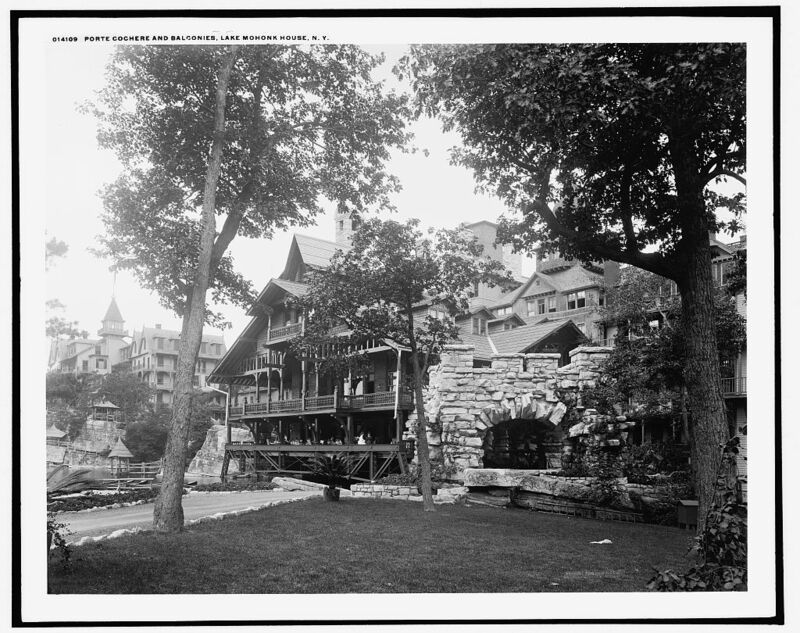 In 1902, the Mohonk Lodge was opened in Oklahoma to stimulate the art of the women in the surrounding tribes – primarily Kiowa, Comanche, and Apache. The store, first proposed by Christian missionaries at the Lake Mohonk Conference, provided the women with hides, beads, paints, and other materials at cost. When the items were completed, they were sold back to the store to provide the women with cash. In addition to new art items, some family heirlooms, such as cradles, were also sold to the Mohonk Lodge. At their 1903 conference at Lake Mohonk in New York, they discussed: (1) the abolition of the Indian Bureau and all Indian agencies; (2) the extinction of all Indian tribal governments; and (3) the division of communal tribal land holdings among individual Indians. Toward the end of its existence, the Lake Mohonk Conference began to turn its attention to the Indian situation in Oklahoma. With allotment and statehood, the tribal governments were now powerless and the utopia envisioned as coming about through privatization had not materialized. Instead, the non-Indians’ greed had no limits. In 1914, Indian reformer Kate Barnard spoke to the group. As a result both the Lake Mohonk Conference and the Board of Indian Commissioners began to work for increased federal protection for the Oklahoma tribes. At the same time, the Lake Mohonk Conference embarked upon an anti-peyote campaign. They suggested that the federal prohibition of intoxicating liquors be expanded to include peyote. In this way more sanctions could be brought against the new Indian religious movement without the appearance of suppressing religion. I am still working on the paper about (my blood relative/distant cousin) Dr. Thomas Augustus Bland who published the COUNCIL FIRE and ARBITRATOR newsletter for Indians; his subscribers included Sitting Bull and Red Cloud, and other supporters of the Indian cause. Drs. Thomas and Cora Bland, Alfred B. Meacham and others disagreed strongly with the IRA motives and instead created the National Indian Defense Association (NIDA) formed in 1885. Under the Blands guidance, The Council Fire became a much more radical publication meant for Indian people themselves. Alfred B. Meacham and the Bland’s held to a radical minority position that was essentially in accord with the proposals brought to President Grant in 1869. George Manypenny, “How the Delawares Were Disinherited,” The Council Fire 9 (June 1886). By way of a miracle, back in 2006 I had posted on rootsweb that I was doing research on Dr. Thomas A. Bland, and (SHOCK) on June 11, 2016 (ten years later) I was contacted by Daniel G., who lives in California, who sent me this stunning photo of Cora Bland (back left), Randall, the interpreter (back right), and seated Dr. Thomas Augustus Bland with Oglala Chief Red Cloud. It is a BIG miracle because Dr. Charles Bland and I had never seen this photo before! Lakota chief Red Cloud was an important figure in the 19th century land battle between Native Americans and the U.S. government. He successfully resisted developments of the Bozeman trail through Montana territory, and led the opposition against the development of a road through Wyoming and Montana for two years—a period that came to be known as Red Cloud’s War. Red Cloud died in South Dakota in 1909. If there were a “just god”, then this government and all NATO governments would have been vaporized a long time ago! I have found out, the hard way, there are some people who can never be figured out! Celebrate this on the 4th, Mr and Ms Colonialists, if you can? Informative and wonderul as usual! Thank you my cherished cherished friend. There is so much information here to mine. I can’t wait to hear more about your cousin. Your Lakota name is beautiful. I feel that way too Jay. Ten years and a photo appeared of Thomas. He is unusual for his time period. I can only hope to find more about him and his work. Thank you Robin. All of us have rights to explore the story and who tells it. Please stay in touch. what a sad and tragic piece of history. Thank you for writing and sharing – I would be none the wiser without it. Thank you Roly. Some stories find us, like this one found me.